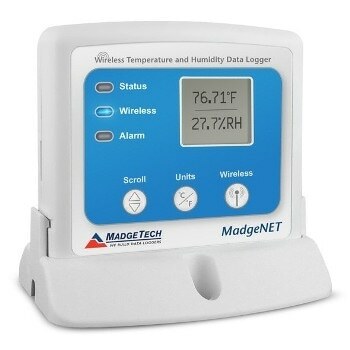 The RFRHTemp2000A is two-way wireless temperature and humidity data logger that is also equipped with an LCD screen. 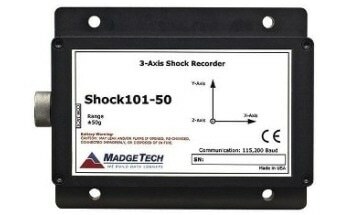 With the capabilities of transmitting data at an unobstructed outdoor maximum of 2000 feet, this tool is also equipped with a unique built-in memory that allows for all data to be stored and easily accessed at any time. The RFRHTemp2000A is a fully calibrated device that has been awarded a Calibration Certificate. As an ideal tool for both industrial or laboratory applications including supply chain storage facilities, incubator monitoring and HVAC studies, the RFRHTemp2000A has been specifically designed with both external humidity and RTD based temperature sensors that allow for this device to achieve a rapid response time for both parameters. Additional functions that are included with this device include the ability for the user to wirelessly start, stop and download data from the device through the use of a wireless RFC1000 transceiver. The use of this transceiver allows customers to quickly access data, ultimately eliminating the need for unnecessary time to be spent on device maintenance. All data collected in real-time by the RFRHTemp200A can be sent to a central PC or downloaded at periodic intervals. The digital LCD display of the RFRHTemp2000A provides the user with real-time data regarding both the humidity and temperature channels, while also providing easy access to the minimum, maximum and average statistics of all logged data. With user programmable alarm settings for both temperature and humidity parameters, an audible buzzer and LED alarm indicator notifies users when the temperature or humidity is above or below the threshold set in the alarm. The RFRHTemp2000A ensures that all users are kept up to date on the activities of all applied systems. Furthermore, users can be immediately notified of any alarms by email and text messages that are sent from within the software. The RFRHTemp2000A can be used as both a single and wireless data logging system, as well as a large scale system that incorporates hundreds of data loggers measuring a number of areas. When this device is expanded to a larger system, additional MadgeTech wireless data loggers and transceivers may be required. The RFRHTemp2000A utilizes the newest version of the MadgeTech Logger Software, which is a highly powerful analytical tool that allows users to easily view data in graphical or tabular formats. Additionally, the MadgeTech Logger Software provides users with summary and statistics data that can be exported to Excel® and other similar software technologies for further analysis.